Congratulations to "Kathy", the winner in Robyn's giveaway. Please contact JUST CONTEMPORARY ROMANCE to claim your prize. Thank you to all who participated! I’m so excited to stop by and share the news about my super, cute rom com releasing TODAY! 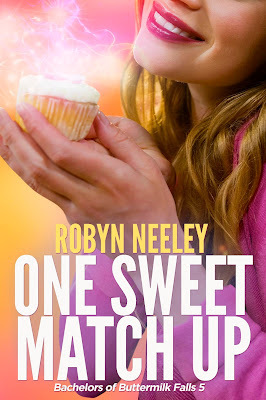 (I’m more than a little excited😊) One Sweet Match Up is the 5th book in my Bachelors of Buttermilk Falls series. Check it out and enter the $10 Amazon giveaway! For years, renown chef Donovan Foster made his life in Denver, way too busy with making a culinary name for himself to stop and pick up a wife and kids along the way. When he realizes that all of his friends in Buttermilk Falls are settling down, he begins to feel idle. Sure, business is good, but he’s tired of his life. Convinced he’s lost his spark, he decides to change directions straight back to Buttermilk Falls in search of it. Being fired by Donovan Foster two days on the job had been one of the worst days of Zoe Mathews's life. Humiliated, she’d hightailed it out of Denver, looking for a fresh start, opening up a frozen yogurt shop in Buttermilk Falls. Nearly a year later, she’s licked her wounds, running the Ice Heaven shop on Main Street. Little did she know that Donovan is the town’s golden boy who recently returned home to find his spark. During a brutal blizzard, Donovan runs into Zoe, but can’t place where they’ve met, a secret she’s determined to keep, even after the snow stops flying. He, on the other hand, is drawn to the beautiful, blond newcomer who possesses the spark he’s been missing. 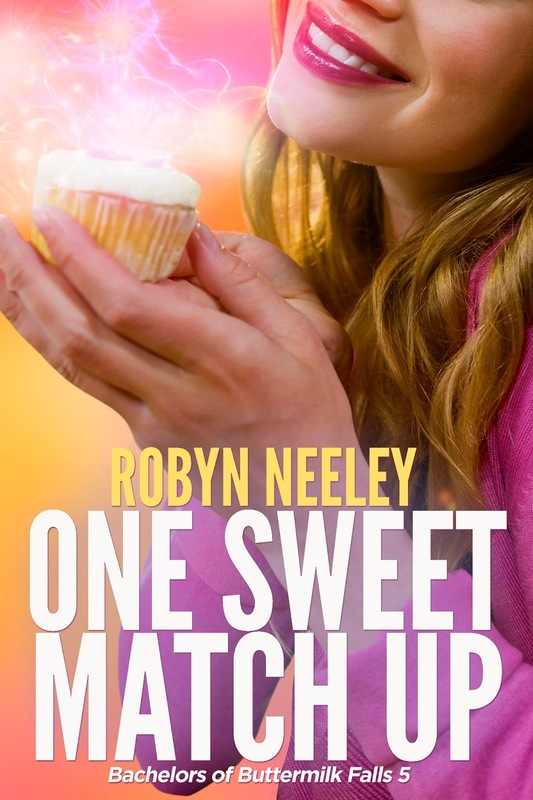 One Sweet Match Up is a laugh-out-loud contemporary romance with a touch of magic, a small town full of loveable characters, and one sassy, matchmaking ghost. It’s the fifth book in the Bachelors of Buttermilk Falls series. Purchase on Amazon. You can also pick up Batter Up (Book 1) for free beginning June 12 for five days only! One of the regular establishments in this series is the Sugar Spoon Bakery, which of course has amazing cupcakes. For a chance to win a $10 Amazon gift card, leave a comment with your favorite cupcake flavor. Sign up for my e-newsletter at www.robynneeley.com for book news and exclusive giveaway. Giveaway ends 11:59pm EST June 5th. Due to GDPR regulations you no longer need to submit your email address in the comments. If you have been selected as a winner your name will be posted at the top of the post. You may then contact maureen@JustContemporaryRomance.com to claim your prize. Your email address will be shared with the author/publicist providing the giveaway. I love double-chocolate with sprinkles!! Congrats on your release. I know this is an exciting time for you. Can this book be read as a standalone? Are there spoilers in it regarding the earlier stories? As for a fav cupcake, I'll go with those with pink frosting. I'm pretty boring. I like yellow cake with chocolate fudge icing. Robyn, just to clarify is this series standalone? I love Harvey wallbanger cupcakes with orange glaze. I have never had a cupcake. They aren't that common here in Italy. I love all types of cupcakes but I'd have to go with red velvet cupcakes! I don't generally eat cupcakes; however, I love making (but, more importantly, eating) banana nut cake, so I guess that could be made into cupcakes instead. When my son was a toddler, he didn't like cake, but I poured the (birthday) cake mixture into cupcake tins and, voila, he loved the cupcakes! Go figure. Now you've got me thinking I should make cupcakes for my 32-year-old son. Thanks for that, LOL!